 winans chocolates Archives | What Should We Do Today? 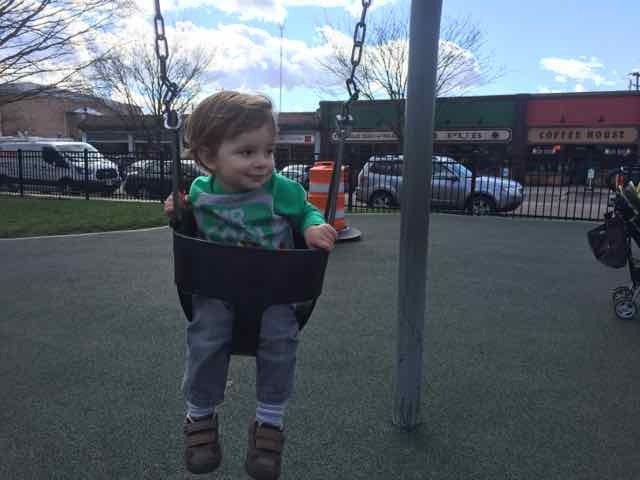 Spring is in the air and park season is upon us. All of us parents, weary from passing endless hours indoors, break out of our shells, stretch and yawn, opening our eyes to the bright sunshine. It’s time to head outside. And I know what you need: coffee. If I had a nickel for every parent I see at the park holding a cup of coffee, I would at least be drinking a Venti right now. What am I giving you in this post? 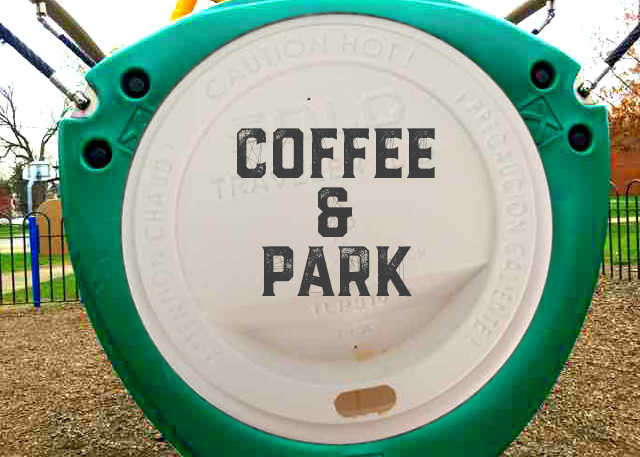 Three coffee/park combinations. And my promise to you is that these will be easy to do. I have chosen three places where you can, with the least amount of effort, pick up your coffee and head to the park. Sure, you could go through the drive through . . . but I’m all about making this an “outing” that’s fun for the child AND the parent. Stop by the coffee shop and then head to the park . . . that’s what spring’s all about, isn’t it? You can literally see the coffee shop from the park. Easy Peasy. It doesn’t get much easier than this when it comes to coffee and park proximity! I stopped in for coffee and got tempted by the yummy chocolate chip cookies. We stayed here to share a cookie and then headed across the street to the park. 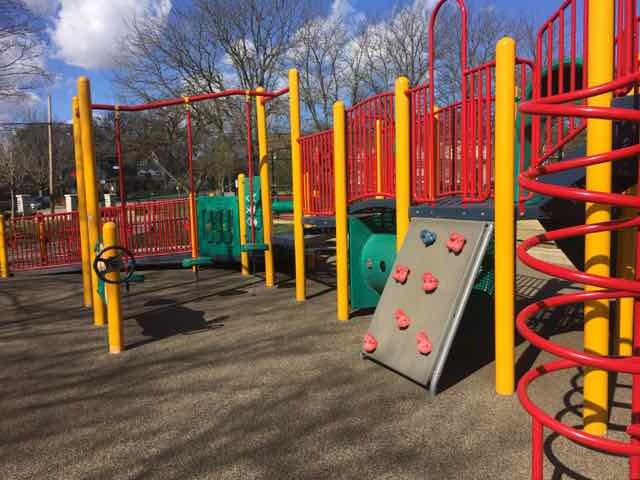 Pierce Field has two play areas, one for older kids and one for younger. There is also a smaller slide and a lady bug to ride on for the toddler set. The park is fenced in and restrooms are available. This park also has free wi-fi! 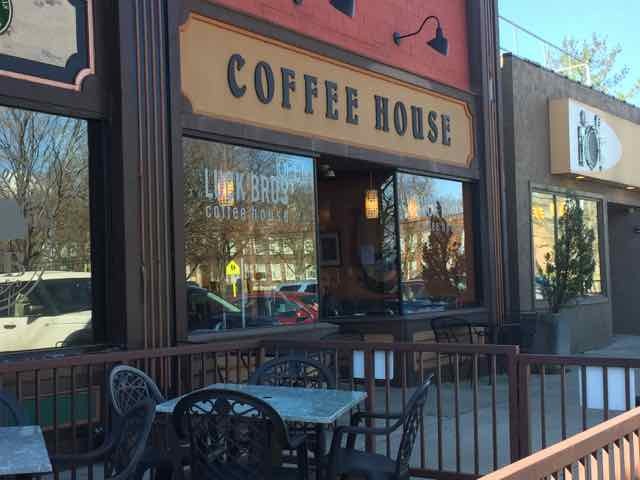 Where to Park: I recommend parking on 1st Ave, which separates the park from the coffee shop. You can park in the parking lot in front of the shops or on the road along the park. Coffee to park is a mere 4 block walk in this case. 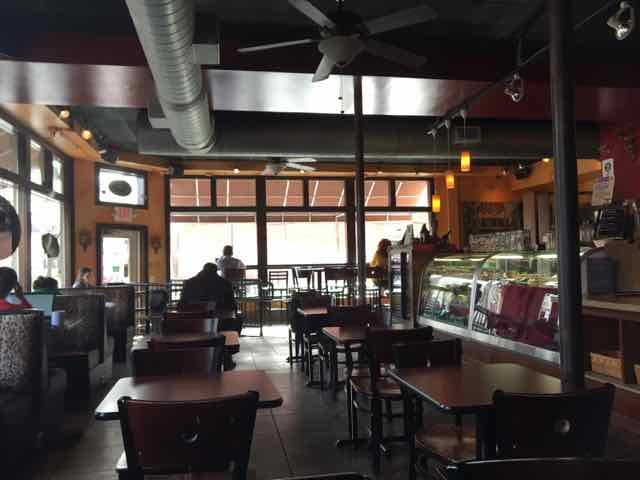 Caffe Apropos serves a large selection of coffee drinks and features a hopping happy hour if you’re arriving after nap time! My favorites here are the Italian sodas, lattes and cookies from Pattycake Bakery. 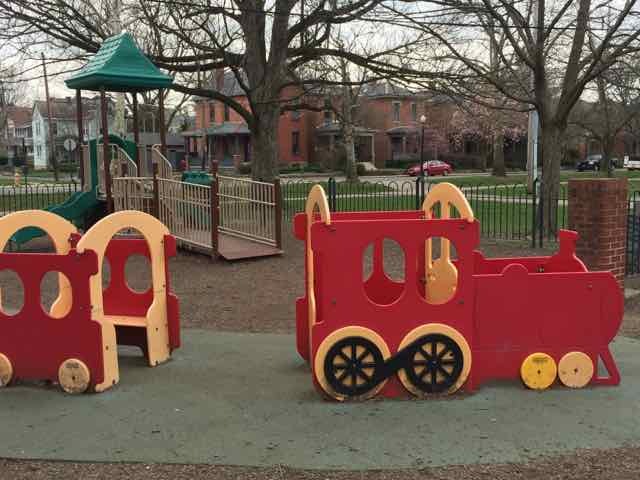 Harrison Park (which is a different park from Harrison West Park if you happen to be Googling) is a newer park with a great play area for toddlers (and one for older kids, too!). 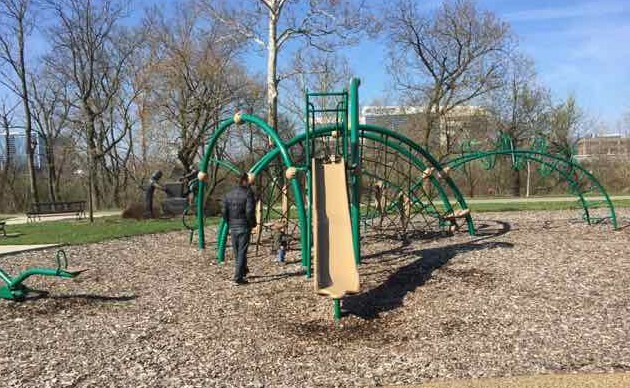 The park is along the Olentangy River and the bike path. There’s a lot of green space here for running around, too. There are no restrooms available (so you might want to limit your caffeine intake! 😉 ). Park: Harrison Park, on Harrison Park Place between W. 1st and W. 2nd avenues. Where to Park: There is only street parking available here but it is free and without a time limit. 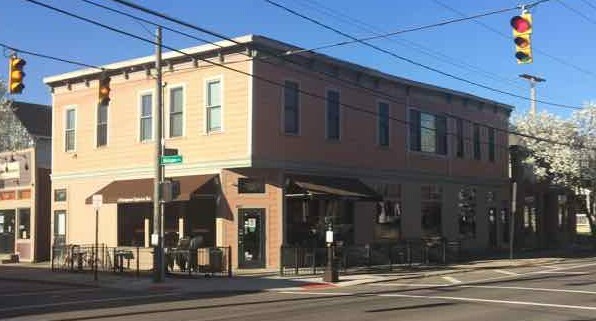 I recommend parking on Harrison Park Place, right along the park and then walking to the coffee shop. If parking is unavailable there, one of the parallel streets will work just fine – Michigan tends to be busy so try Perry, or Oregon between 1st Avenue and 3rd Avenue. 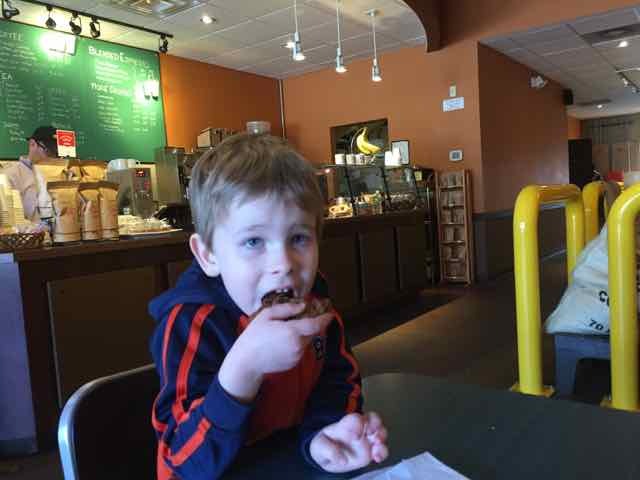 Be forewarned that your kids will want chocolate when you get to Winans to order your coffee. Who wouldn’t?! The coffee is good and perusing the beautifully made chocolates is worth the stop on its own! 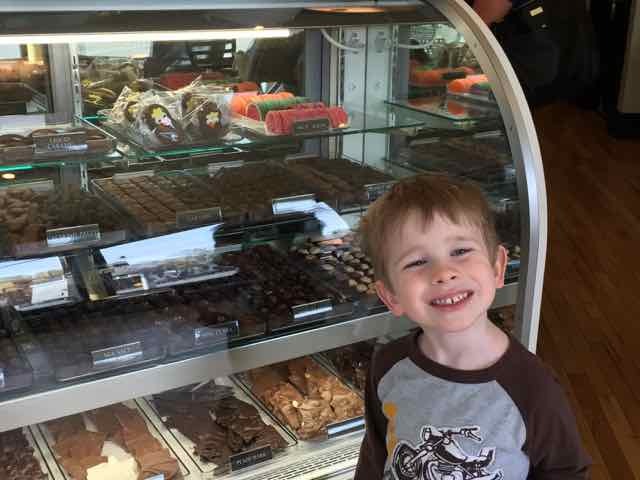 When we visited, the friendly staff gave my kids a free treat – which was awesome! The walk to the playground will set you back about a half a mile through the park, but walking through the park is, well, a walk in the park. Sorry, I just couldn’t resist! You could add in a detour around the pond to feed the ducks or through Huntington Garden, around the Statue of Schiller, which is beautiful in the springtime! 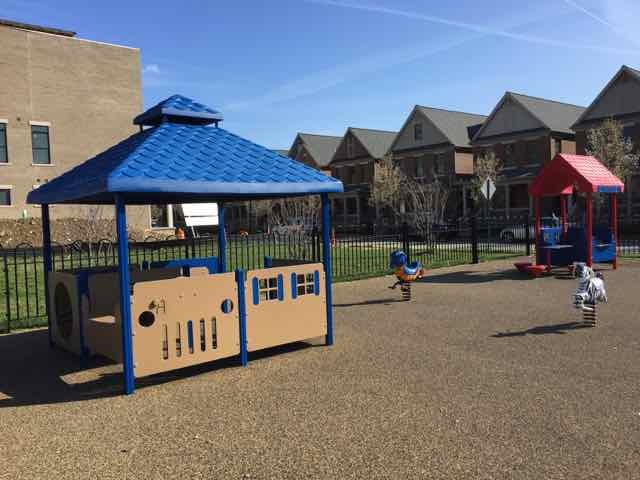 The playground area is great for all ages. My kids have loved playing on the train. The playground is pretty well fenced in and shady! Restrooms are available. Where to Park: My first suggestion would be to park on Reinhard, along the park. 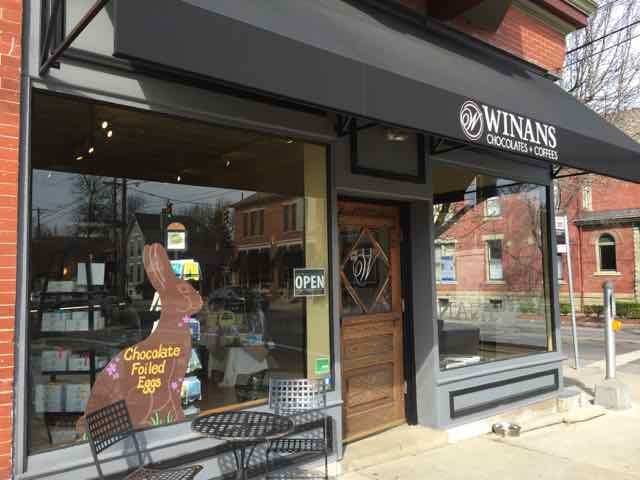 Winans is about 2 blocks from the park entrance on Reinhard. 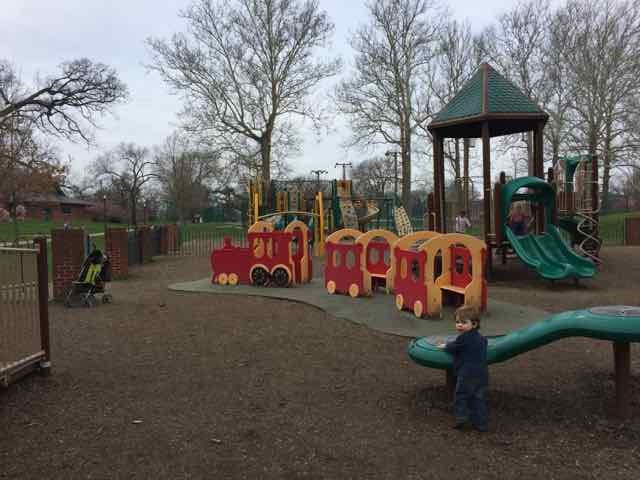 The playground is on the other side of the park, and there is also a parking lot inside the park, closer to the playground area, if you want to start there. (Enter at the corner of Jaeger and Deshler). I hope you have as much fun trying out these combinations as we did!